We recently put the new EBU.IO/QC tool into production. Most of the work was done by Julien Grünhagel. The main reason for moving to a new design was to make the QC tool more responsive. We felt the original lay-out was too limited for mobile/tablet use. We especially saw problems managing the sheer amount of tests (> 200!) using the QC Card metaphor. Faster searches Ajax-based quick search is available in the places where information density is expected to be highest. Responsive design The information now is served faster, adapts better to your screen and aligns with the new EBU.IO design. Easier Profile management The new EBU.IO/QC allows you to manage profiles using a 'Filezilla' style interface. Integrated help The help wiki is now fully integrated into EBU.IO/QC. Better discussions QC Group Editors participants benefit from better discussion threads and linking from the discussions list. We are continuously pushing small improvements into production. 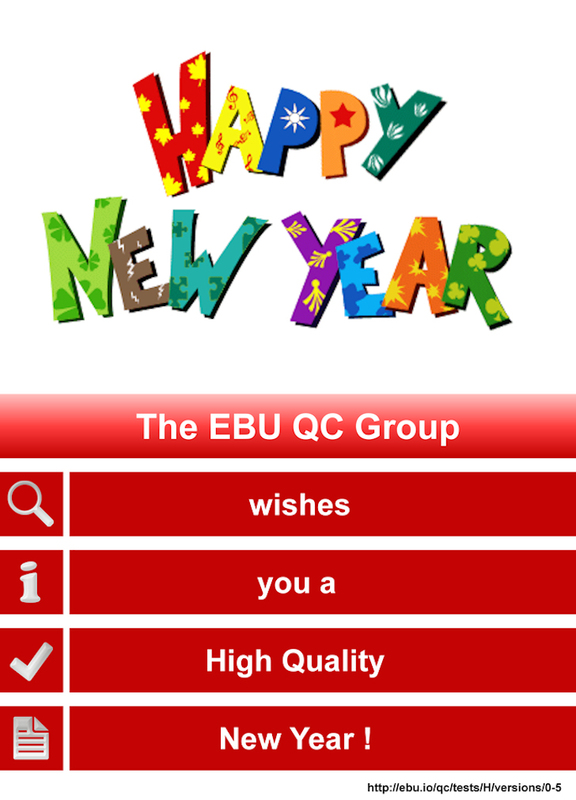 Important upcoming improvements concern QC Test editing functionality (available to QC Group Editors). 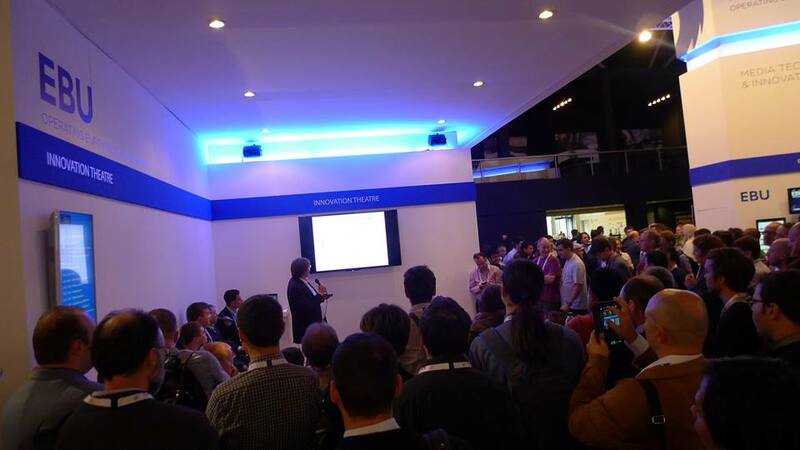 Open-source meetup hosted at EBU stand during IBC 2014 has exceeded all expectations on 13th September with over 100 participants and 14 lightning talks presentations. Started some years ago with only 6 people in the meetup it has rapidly gathered more interest with broadcasters, integrators and manufacturers joining. The meetup is a good opportunity to network and learn about projects and activities. Many manufacturers present at IBC offer solutions based on open source software and sell integration or expertise. This can be for production, encoding, streaming or even broadcasting. Stay tuned for next year edition. Thanks to Mathias and Maximilien during RadioHack, the RadioDNS manager is now supporting the last version of the RadioEPG specification. It has been the opportunity to fix some compatibility issues with the Pure Sensia and other devices. Extensive filtering options, including ‘show me what is new since last log in’. A diff-view with colouring to show what was edited. A discussion overview to see the latest contributions. Note: by default you do not have full access, contact dejong@ebu.ch to be added to the list of users. EBU.io is now running a Jenkins environment which tests every pull requests sent to CPA Github repositories. This new tool allows to check that the tests are successful and projects are in a consistent state. We are using it for the CPA projects to make sure that we don't break the system while merging changes from others as well as packaging the system for deployment. Released experimental services (RadioDNS and QC) in EBU.io are now daily backed up using the following pattern: Each day at 2 o'clock, a backup is made including databases and files uploaded to the application. Then, they are saved in Amazon S3. After 1 day, the files are moved to Amazon Glacier for cost efficiency. We bought a ssl certificate (wildcard: *.ebu.io) for CPA. We started to deploy SSL on every domain. CPA domains and ci.ebu.io are now reachable using HTTPS. Thank you to everyone who is working hard to improve the platform. The Quality Control tool to manage Frans cards has just been rolled out and the group will start to use it in the next weeks. The access is restricted, feel free to ask Frans for a demo. In the meantime, you will find attached some screenshots. Thanks to Frans and Maximilien for the great job. The objective of the CPA project is to produce a protocol in order to authenticate users on media platforms. This protocol will be delivered with a reference implementation. The related code projects have been opened this week and we are starting to collaborate with people outside the BBC next week. The list is growing and the page is now presented with a new layout. Feel free to encourage people to fill this page with their open source projects.